South Wales based foodies and social media users can't fail, over the last few weeks, to have noticed the buzz that's been created by journalist, home cook and baker Elisabeth Mahoney's new venture The One Mile Bakery. There was such chatter at one point that I jokingly tweeted that I'd soon be opening an Estate Agents in Pontcanna as I was expecting a property boom as everyone tried to get into the catchment area! Well The One Mile Bakery bills itself as is a small, passionate food company delivering beautiful, wholesome artisan bread and partners for great bread (soups and preserves) within a one-mile radius of its kitchen. What to me sets it apart from other micro-bakeries I've come across is that it has a rather unique business model. Food is sold on a subscription basis (monthly or three-monthly), with six different packages available namely, Classic Breads; Sourdough; Classic & Sourdough mix; Bread and Soup; Bread & Jam; Just Soup. Currently serving Pontcanna, Llandaff and Canton; Elisabeth delivers everything on foot or by bike. The business is very eco-friendly sourcing all ingredients locally wherever possible. Soups and preserves are also made from seasonal ingredients. All packaging, except the labels, is 100% compostable. Sounds good so far. Elisabeth kindly offered to let me try a sample delivery to see what I thought, but as I live well outside the catchment area, there were a few logistics to sort out but eventually I was able to detour MrsA on her way home from an appointment to call in and collect. What we had been given was a typical first delivery for the Bread, Soup & Jam package (£23.50 a month). There were two loaves of bread, some jam and a large tub of soup with a garnish of fresh herbs to sprinkle on top. 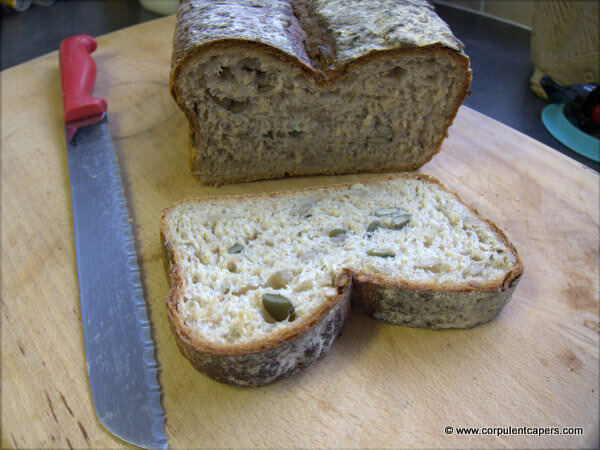 The first loaf of bread was Seeded & Honey Loaf. I was in work when MrsA got home, but she rang me to ask if she could have some of the bread, which confused me a little. She was just 'being polite,' she said as 'it was my sample'. When I got in I asked how the bread was – "You're lucky you've got any left", she said. Once I'd cut myself a slice I could see that she wasn't joking. We'd actually planned steak for dinner that evening, but we looked at one and other, put it back in fridge and started to butter bread and warm the soup. That Honey Loaf is divine, it's moist, flavourful and with bags of texture. I'm not exaggerating when I say it might be my favourite bread ever! The soup was Carrot and Cardamom. This soup caught me by surprise as the aroma was fresh not spicy, but by the end of the second spoonful my whole mouth was enveloped with a gentle warmth from the Cardamom. The spicing here was very well judged I thought. Cardamom has such a strong, unique taste whenever I see it billed high on a dish I'm often expecting it to be the dominant flavour to the detriment of everything else. However, here it was subtle, slowly creeping onto the palate and never in danger of over-powering the freshness of the carrot or the brightness of the garnish. Elisabeth bills this as a 'sunny soup for a wet day' I can't think of a better description. Our other loaf was an Amaretto Sourdough. Now this did make me shiver when I first read the label as I had visions of half a bottle of cheap liqueur being poured into the mix. Luckily The One Mile Bakery had supplied some notes with the delivery and so I was able to see that this Amaretto is infact a Spring Wheat, that is grown in Hertfordshire but milled by Anne Parry at Felin Ganol, her watermill in Ceredigion. Amaretto flour is lower in protein than most bread flour and doesn't like to be overworked. Elisabeth is still tweaking her recipes to get the best from this flour, so included this loaf on the basis it was 'experimental'. Despite being a little too dense for me, it still had a great flavour. I've tasted lots of sourdough that did well in the consistency stakes only to fail at flavour. This one though really carried that distinctive flavour of a good quality sourdough. Finally we opened the jam, Strawberry, Raspberry and Vanilla. The first thing I noticed here was the 'set' it was nice and firm. I often buy jam at farmers markets only to find that I've really bought a thick fruit soup. At the other end of the spectrum we find the mass produced jams that, whilst always set, tend to spread as if they were jelly. This was thick and firm but with a great spread, a little sweeter than our own home made jams, it nevertheless was well balanced, again with a great flavour combination. Everything working in harmony and nothing clashing or masking the other flavours. 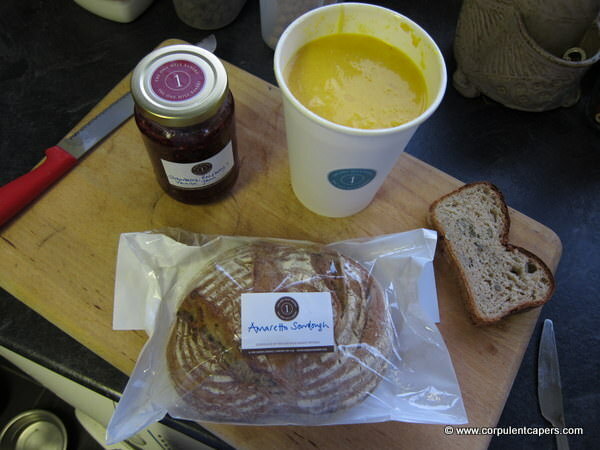 At £23.50 a month (you get a 10% discount if you sign up for 3 months in advance) the Bread, Soup and Jam subscription, although the most expensive package, still provides excellent value based on the quality of the items in my sample. The Classic Bread package, on the other hand, gets you a weekly delivery of a handmade classic loaf made from organic stone-ground flour for only £9 a month. If you live in Pontcanna, Llandaff or Canton then all I can say is you're very lucky indeed to be able to take advantage of The One Mile Bakery's output. Unfortunately, I'll have to wait until they launch the 23 and a Half Mile Bakery!